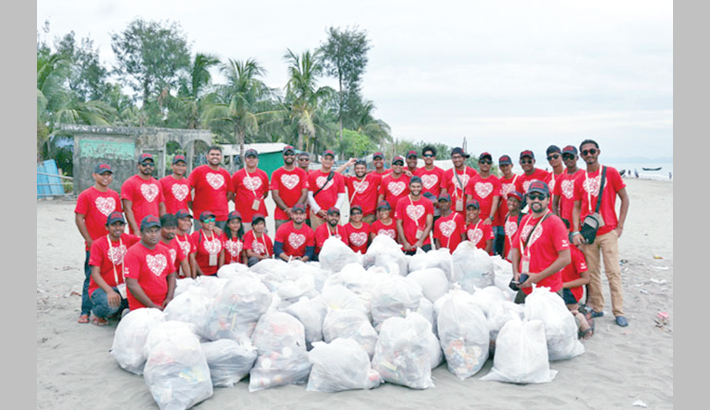 Coca-Cola Bangladesh, as part of its global partnership with Ocean Conservancy’s country coordinator Kewkradong Bangladesh, is working towards a clean and pollution free seashore of St. Martin’s Island caused by littering. In collaboration with the Kewkradong Bangladesh, Coca-Cola Bangladesh is collecting waste and debris from the seashore to keep the oceans and waterways clean and clear. This partnership is aims towards sustainable cleanliness of waterways while also driving actions and fostering innovation to understand the causes of marine debris and working on the elimination of the ocean littering. The two organisations coordinated a day of cleaning and collecting waste during the 31st annual International Coastal Cleanup, which also marks the seventh year of collaboration, at St. Martin Island, Bangladesh’s only coral island. While focusing on the commitment of Coca-Cola for a cleaner environment and the significance of choosing St. Martin Island for the activity Shadab Khan, Managing Director, Coca-Cola Bangla-desh said, “The scenic beauty of St. Martin’s Island’s is unparalleled, and as the beautiful coral island attracts huge number of tourists, which always comes with risk of unbalancing the sensitive ecology. International Coastal Cleanup is the world’s largest volunteer effort, attracting thousands of participants to collect millions of pounds of waste and debris from beaches, lakes and waterways. In the last seven years in Bangladesh over 3500 volunteers through the Coca-Coca Bangladesh and Kewkradong Bangladesh partnership collected 8400 kilograms of marine debris. This year’s campaign slogan was ‘Pick it up, clean it up, sea change’. Students, school teachers and professionals from different parts of the country participated in this event. The volunteers also included a representative of Chairman of St. Martin’s Island, Noor Mohammad and representatives from Union Parishad. Participants took part in this the event by working in small groups. Their main focus was to collect non-disposal wastes such as plastic bottle, chips packet, cigarette filters etc. After collecting the waste it was disposed at a specified location and sorted out all patterns of waste items collected during the event. All the information’s has been uploaded to Ocean Conservancy’s global ocean trash database. The day after the launching event, note books were distributed to local students which had different types of awareness message included to clean sea written on them. Among volunteers there were students and professionals from various reputed universities and organisations. Since the land-based debris is the prime reason for the pollution of ocean water and marine environment, the programme aims to advocate for the behavioural change of the dwellers, school students and tourists of St. Martin’s. Volunteers who have joined this cleanup initiative at St. Martin are expected to play a key role in spreading the message of how to reduce pollution among peers and other networks upon their return.